Smelling the flowers in Flagstaff, Arizona. A St. Eve arm party. Hydrangea bush in San Sebastian, Spain. TJ Maxx Skirt and JCrew Sydney Patent Heels. Pink Peonies and I illustrated by Inslee in our chevron skirts. Vanilla cupcake with a cherry on top. Fashion Night Out with these AZ Bloggers. 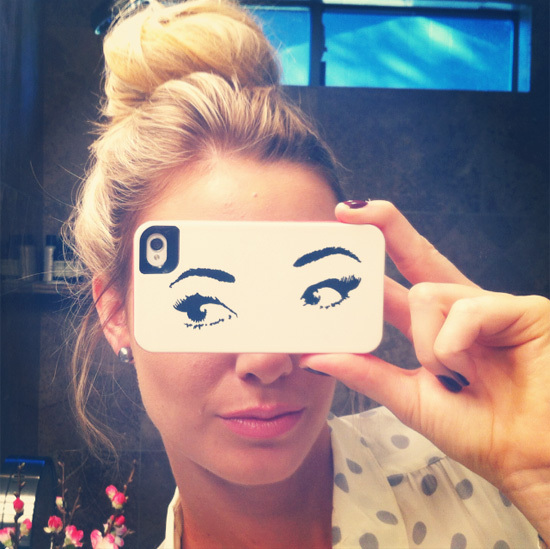 My favorite Kate Spade All Eyes iPhone case. I couldn't get around to my hair post, so look for it next week! In the meantime, follow me on instagram @runnginonhappiness! Happy Friday! all gorgeous! Love the KS phone cover! i love your Instagram pics! I love the hydrangeas, definitely my favorite flower of all time! And the Kate Spade case makes me really want one! Oh!!! So cool that Inslee did a design of you. I am obsessed with her work, so the two of you in one spot-AWESOME! Yay, so glad I can follow you on instagram. Love these pics. i love your fishtail braid! it is so cute. I love all of these photos! I love the vibe you give! Happy Friday hope you have a wonderful weekend! Hahah that iPhone case makes me giggle :) Love so many of these photos! love your fish tail braid! Teach me your way :) The iPhone case wins too! I've just created my own blog and I need opinions and help from blogger with expirience, so if you can, I'd love you to visit www.barcelonalifestylescrapbook.com and tell me what do you think! I'm in love with your fishtail braid. Your beautiful! Love that iphone case and your hair. Would love for you to stop by my blog. New to your blog and I'm obsessed already! Can't wait to be a frequent visitor! Love your arm party and so jealous Inslee illustrated you! Love the Kate Spade iPhone cover, and also, the illustrated drawing of you! SO cool. That would make such a great gift for a friend, to have them illustrated like that. Ahhh, lovely Blog! so full of great ideas! You are welcome to stop by my blog, I sell beautiful "recycled" high end fashion!